Wow - delicious! Once again it proves the rule that anything tasty can be even tastier by just putting it in an ice-cream maker. The mixture itself was good, and as ice-cream, even better. We were going to have it with the rhubarb jelly below, but it took too long to set, so we just had it by itself. As with most ice-creams, you just make a custard with eggs, sugar and cream, then add the fruit, and put in the magic ice-cream machine! - Cook 1 kg rhubarb in a dish with 300g sugar, covered with foil, for 45-60mins at 190C. - Drain, keeping the juice, and beat the fruit with a fork until smooth. - Beat 2 egg yolks with 45g sugar. - Heat 280ml single cream to just before boiling point, and add to the egg yolks. - Put the mixture on a low heat and stir constantly, until it thickens to a custard. - Plunge the whole pan into cold water, to cool it down, keeping stirring. 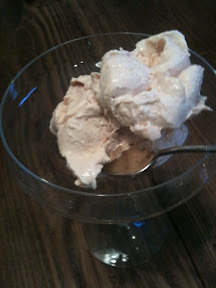 - When its cool, stir in the rhubarb pulp, then add 280ml double cream (lightly whipped). 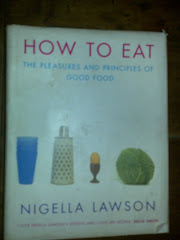 - Add sugar to taste, one tablespoon at a time. - Add vanilla before putting in the ice-cream maker.